Oh, The Things I've Learned- ANGIE SANDRO: FOREVER #HALLOWEEK FRIGHT NIGHT STORY! FOREVER #HALLOWEEK FRIGHT NIGHT STORY! Hi! It's time for the FOREVER #HALLOWEEK FRIGHT NIGHT STORY! 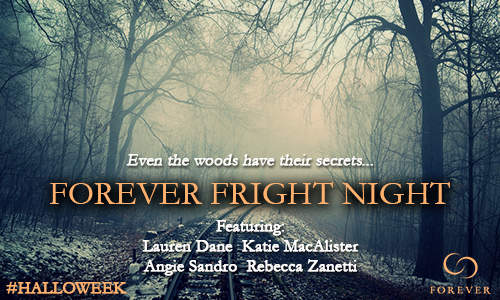 Forever authors Lauren Dane, Katie MacAlister, Rebecca Zanetti, and I have joined forces to put the spooky in Halloween. This collaborative short story will give you the shivers in all the right places! Below are the blogs participating and which author will appear on each (blogs will have their post up by 10 AM EST). Be sure to read the story in order or you'll be really confused. There will also be a fun giveaway featuring books from all the authors. Here is the rafflecopter link. Before you go, don't forget to enter my Goodreads giveaway of DARK EMBRACE. I'm giving away (1) autographed paperback copy to a lucky winner. This giveaway is international, 'cause I didn't want to leave anyone out. It ends next week, so don't wait too long to enter. You may be the lucky winner.